Sarah E. Nutter joins the University of Oregon’s Lundquist College of Business from Fairfax, Virginia, where she has been serving as dean of the School of Business at George Mason University since 2013. She is a professor of accounting and has more than three decades of experience in teaching and research. 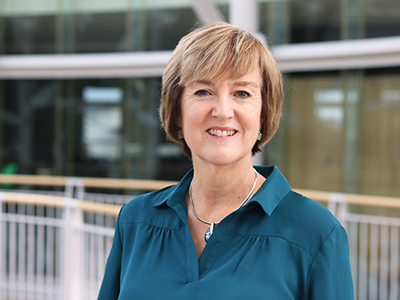 She is also a seasoned university administrator, having served as GMU’s accounting area chair, director of its executive MBA program, and interim university chief of staff before assuming her most recent role as dean. After earning her MBA and doctorate in accounting from Michigan State University, Nutter joined the faculty at George Mason in 1995. While at GMU, she received the executive MBA program’s Outstanding Faculty Award five times. She was also a presidential fellow with responsibility for campuswide initiatives and a senior scholar at the Mercatus Center. Nutter currently serves on the Initial Accreditation Committee for AACSB International, the world’s leading business school accreditation organization. Previously, she served as the president of the Accounting Program Leadership Group of the American Accounting Association. Associate professor of accounting Kyle Peterson was named the Stewart Distinguished Professor for 2019, one of the college's top honors. A generous gift will create the Dan and Peggy Neal Fund for Excellence in Entrepreneurship and Innovation, yielding dividends for generations to come. Making the career connection, driving up rankings, taking home trophies, and much more in the Fall 2018 issue of UO Business: The Magazine. Nutter, Sarah, E. "Fair Value Accounting: An Age-Old Debate." Journal of Law, Economics, and Policy, 6, no. 2: 185–192.